I know, I know. Everyone else made these months and months ago. I’m late to the party as usual. But better late than never, right? In this case, most definitely! I knew these cookies would be good before I even took the first batch out of the oven. The sliced dough tasted awesome, my kitchen smelled amazing delicious, and the finished product is out of this world–chocolatey with a bit of salt. Mmmm. If you’re looking for a really easy-to-make yet outstanding chocolate cookie recipe, I highly recommend this one. And in case you were wondering why they are called World Peace Cookies, according to the cookbook, Dorie’s neighbor said that a daily dose of these cookies “is all that is needed to ensure planetary peace and happiness.” And I concur. 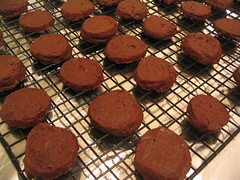 Packed airtight, cookies will keep at room temperature for up to 3 days; they can be frozen for up to 2 months. My note: I was too lazy to cut up chocolate so I used mini chips instead. they look great! i love the salt/chocolate idea. I made a Dorie recipe today, too! I read this recipe when I was trying to decide what to make. Such a cute story! More Dorie! She’s a food blogging phenomenon. I almost made these cookies. I still might. I just ate another piece of her banana cake that I made last week (and froze the leftovers) and it’s soooooooo good. I made this for a cookout this weekend and everyone really liked them. I did add some toasted pecans (I love pecans!) and used part bittersweet chocolate and part of an extra dark chocolate bar, chopped finely. I have yet to make these but really want to. Dorie’s recipes are always so tasty!